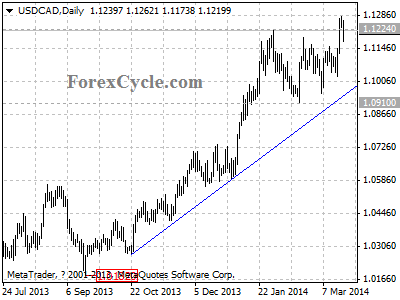 USDCAD broke above 1.1224 previous high and reached as high as 1.1278, indicating that the uptrend from 1.0182 has resumed. Further rise could be expected, and next target would be at 1.1500 area. Key support is located at the upward trend line on daily chart, only a clear break below the trend line support could signal completion of the uptrend.